Attractive shrublike tree adds beauty to the landscape with its fragrant white blossoms in spring and fiery orange-red foliage in fall. Round, 3/8-in. red-purple berries appear in late spring. 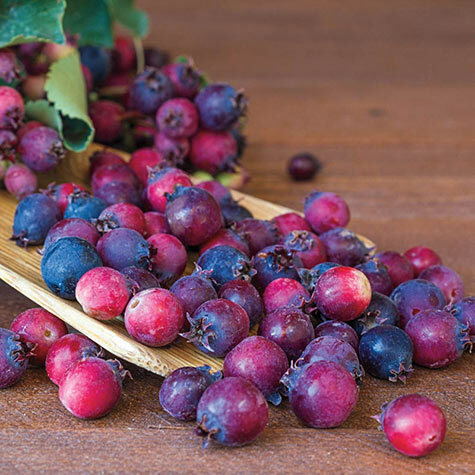 Birds are fond of the berries that have flavor reminiscent of blueberries and can be used in jams, pies or eaten fresh. Plant in full sun to partial shade. Grows 15-25 ft. tall. Potted. Zones 4-9. Foliage: Deciduous, finely-toothed, oval leaves, 3-4" long, emerge with bronze-copper highlights in early spring, mature to dark green, then turn to brilliant orange-red in autumn. Fruit: Red-purple, round, 3/8" berries appear in late spring to early summer, and mature to a dark purple. Their flavor is reminiscent of blueberries. Soil Requirements: Rich, moisture-retentive, well-drained soil with plenty of organic matter. Comments: As its name suggests, this variety is know for its outstanding orange-red fall foliage. Fragrant, white flowers appear in spring, followed by red-purple, round berries. Birds are also quite fond of the sweet berries, with flavor reminiscent of blueberries. Excellent as a focal point in the landscape, as it adds beauty in every season-elegant, white flowers and bronze-tinted young foliage in spring, dark green foliage in summer, amazing fall foliage, and an attractive branching structure in winter. Use in a woodland garden, at the back of a border as a background for smaller shrubs and perennials, or along the edge of a wooded area.